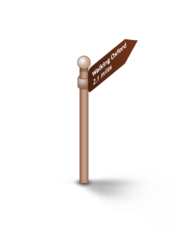 From Oxford Castle & Prison, walk to the Ashmolean Museum before calling at the Oxford University Museum of Natural History. Visit the Pitt Rivers Museum and then take in the iconic Sheldonian Theatre. Pause at the “Bridge of Sighs” and enjoy the Radcliffe Camera before visiting the Bodleian Library. Explore the Covered Market and the arrive at the University of Oxford Botanic Gardens. Oxford Castle dates back 1,000 years – the Saxon St. George’s Tower will provide you with some stunning views across the city. Enjoy the tours, the 900 year old crypt in St. George’s Chapel and learn about the history of this great building. 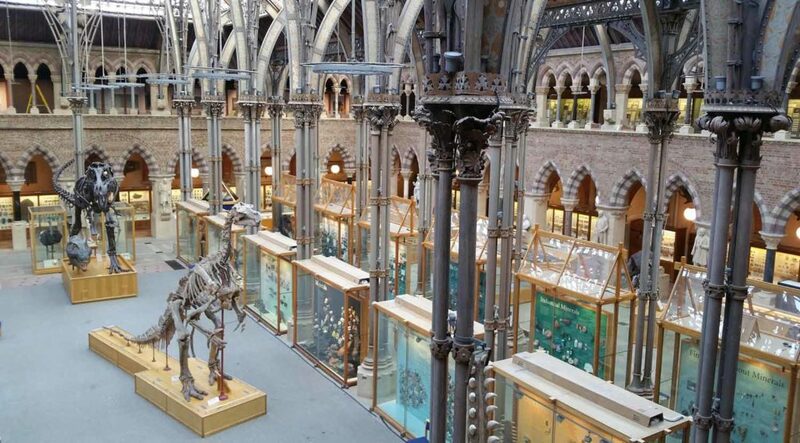 Explore the world’s first university museum built in 1863 – home to the University of Oxford’s collection of art and archaeology. The OUMNH, created in 1860, is home to many of the University’s great collection of geological and zoological specimens, artefacts, exhibits and collections. An educational and fun filled trip for all the family. 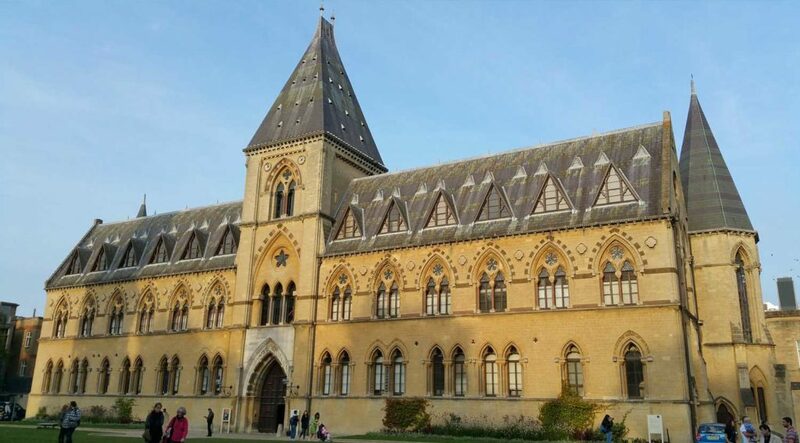 Close to the OUMNH is Pitt Rivers Museum where you will find over 500,000 archaeological and ethnographic collections and exhibits from around the world. Explore the galleries and take in the weaponry, tools, sculptures and textiles from across the globe. Designed by Christopher Wren and built in the mid 17th century, The Sheldonian Theatre is an iconic Grade I listed building serving as the ceremonial hall of the University of Oxford. 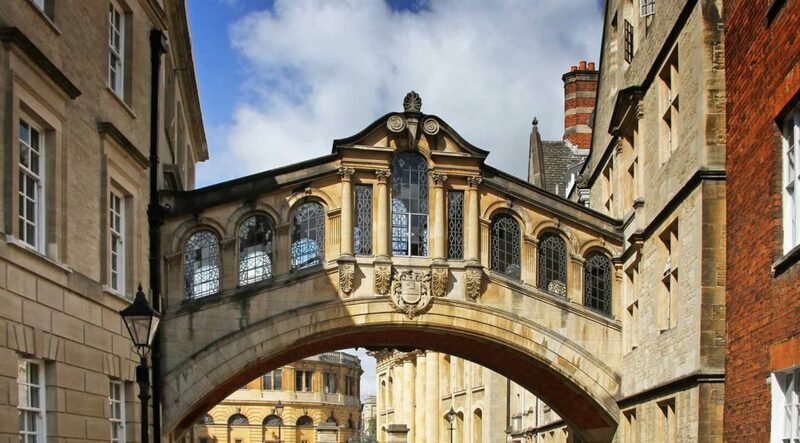 Bridge of Sighs, or Hertford Bridge, is an iconic landmark linking two Hertford College buildings on New College Lane. Completed in 1914, the famous bridge provides a popular photo opportunity for tourists. 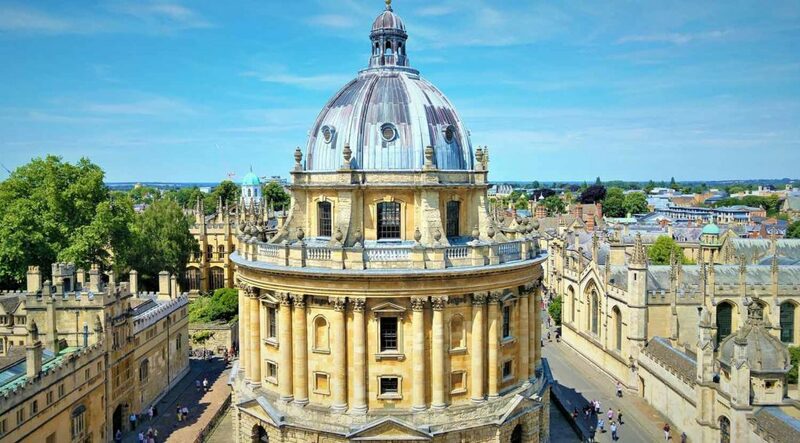 Built in the mid 18th century to house the Radcliffe Science Library, the Radcliffe Camera is one of Oxford’s landmark buildings with its circular drum and dome Palladian design. The building contains two reading rooms and 600,000 books. 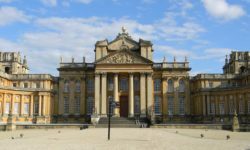 One of the oldest libraries in Europe and the main research library for Oxford University, the Bodleian Library, or “the Bod”, is home to over 13 million printed items and second in size only to the British Library. The historic covered market opened in the late 18th century and operates as an indoor bazaar, packed with numerous traders – traditional market shops, butchers, bakeries and stalls selling shoes, flowers and gifts. The oldest British botanic garden and of one of the oldest in the world, the University of Oxford Botanic Gardens was founded in the mid 17th century. The gardens cover 130 acres and over 6000 specimens – explore the various gardens, Harcourt Arboretum and Herbarium Room. 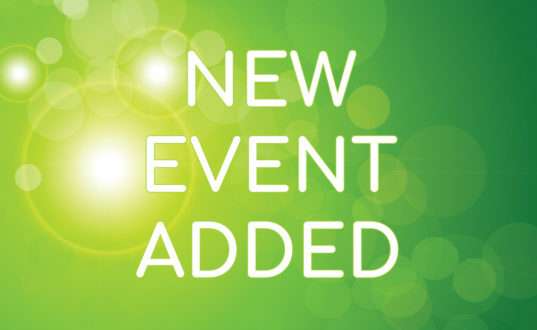 Start your journey at Oxford Castle & Prison exploring the towers and years of history. Call at Ashmolean Museum en route to amazing Oxford University Museum of Natural History before arriving at the Pitt Rivers Museum. 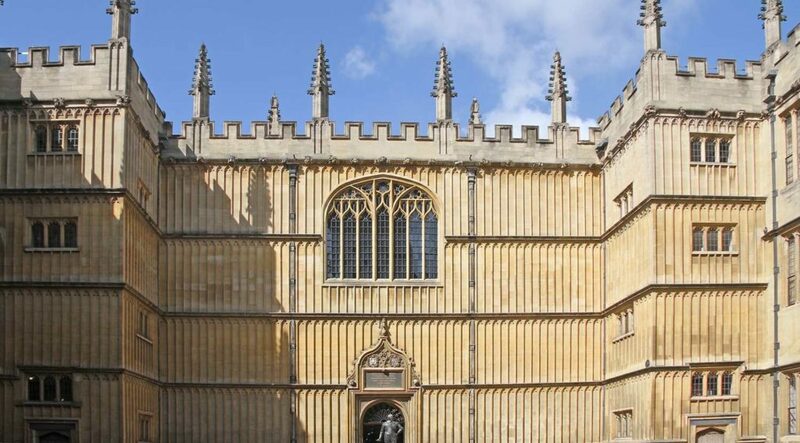 Explore the iconic Sheldonian Theatre before taking in the famous “Bridge of Sighs” and marvelling at the impressive drum shaped Radcliffe Camera. Pause at the Bodleian Library before enjoying the Covered Market and finishing up at the amazing University of Oxford Botanic Gardens. Climb one of the towers – Oxford Castle is a good vantage point – to get some amazing panoramic views of the great spire city of Oxford, resplendent in great architecture and iconic buildings, many of which are world renowned. 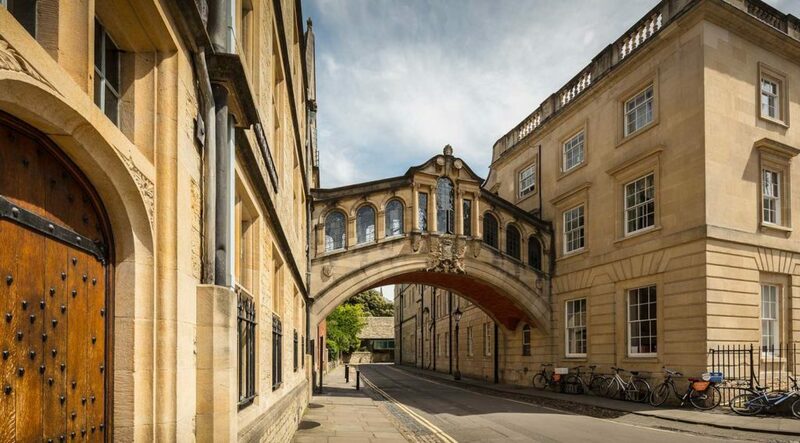 Tour the streets and take in the college buildings and atmosphere – among the 38 colleges, famous names include Magdalen College, All Souls College, Corpus Christi College and The Queen’s College. The city is famous for its impressive architecture – evident in the many iconic buildings spread across the city. From golden stone, bridges, leaded roofs, sculptures and monuments there is plenty of beauty to catch the eye.